There are few wildlife experiences in the world like a week spent in the Botswanan wilderness. This classic itinerary offers a lodge and luxury camping combination safari. The lodges are beautiful, comfortable & make for a great adventure safari though the world famous parks. Departs: Maun, Botswana on Sunday at 9:00am. 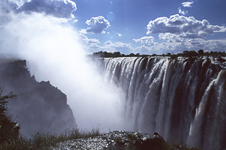 Ends: Victoria Falls, Zimbabwe on Friday at +/-8:00am. 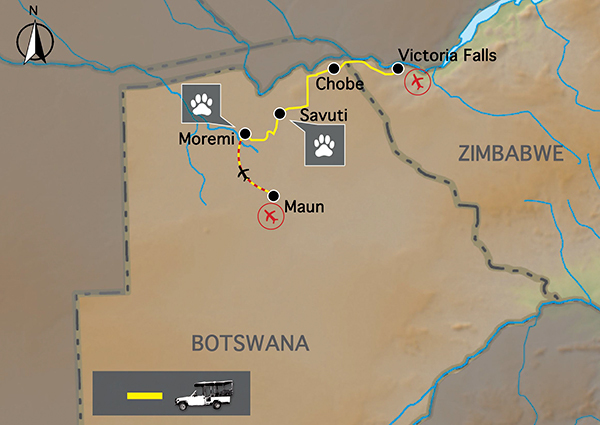 •	Victoria Falls, Moremi Game Reserve, Savuti & Chobe National Park. • Moremi Game Reserve – game drives. • Savuti – game drives. • Chobe National Park – game drive and river cruise. • The accommodation throughout this classic journey is of 3- to 4-star style and are chosen not only for their service and comfort level, but also for their wonderful locations and local wildlife viewing opportunities. • All rooms have private en-suite facilities. • For the 2 nights in central Chobe NP we stay in mini meru tents. Each tent has twin camp beds with linen and en suite chemical toilet and bucket shower with hot water off the fire. • 8 breakfasts, 4 lunches and 7 dinners are included. All of which are provided by the lodges at which we are staying. • Due to travel arrangements or game viewing activities, the included lunches will be picnic lunches. • Where meals are not included there will be an opportunity to buy a meal en route or at the a restaurant in the evening. SAFARI COST: $3,510 per person sharing. This safari starts at Maun airport where you will be met and after a short briefing, you will board a light aircraft flight to Khwai. You will then be met by your safari guide and enjoy your first game drive to the lodge. 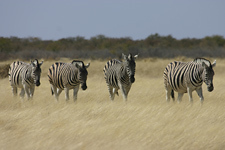 Moremi Game Reserve is the jewel of Botswana and arguably one of the best wildlife viewing destinations in Africa. To the north of Moremi is a vast wilderness consisting of open grasslands and forest and abundant wildlife. Our lodge is situated on a large concession in this wilderness, overlooking a waterhole, the thatched deck allows us to watch the animals in the afternoon as they come down to quench their thirst. Moremi’s wide variety of habitats makes it a birdwatchers paradise. Our days are spent on open 4WD game drives in Moremi GR and on the wildlife concession along the Khwai River. Includes: Light aircraft flight, game drives & National Park Entry Fees. Day 1: Lunch provided by the lodge. Day 1: Dinner will be a set menu provided by the lodge. Day 2: Breakfast will be provided by the lodge. Day 2: Lunch provided by tour leaders. Day 2: Dinner will be a set menu provided by the lodge. Day 3: Breakfast will be provided by the lodge. Day 3: Lunch provided by tour leaders. Day 3: Dinner will be a set menu provided by the lodge. Overnight: Hyena Pan - exclusive private tented bush lodge, bordering Moremi Game Reserve. Twin share permanent tented lodge with en suite facilities. WiFi not available. Distance / Time: Short 20minute flight in small aircraft, morning & afternoon game drives +/-4hrs each. 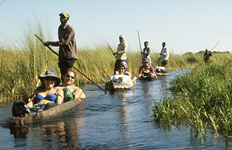 Optional Activities: Helicopter flight over the Delta (own expense US$140pp). Includes: Entrance fees, morning and afternoon game drives in open 4WD game viewing vehicle. Day 4, 5: Breakfast provided by tour leaders. Day 4, 5: Lunch provided by tour leaders. Day 4, 5: Dinner provided by tour leaders. Overnight: Mini Meru Serviced Camping – twin camp beds with linen and en suite chemical toilet and bucket shower with hot water off the fire. WiFi not available. Distance / Time: 350kms, ± 8½ hours, excludes game drives & stops for wildlife viewing. Our next destination is Chobe National Park. We depart Savuti and head north through the remote wilderness of Botswana to the small town of Kasane and our lodge on the banks of the Chobe River. The following day we head back into Chobe NP on an game drive in the early morning before heading back to the comfort of the lodge during the heat of the day. The afternoon has a surprise is a boat cruise on the Chobe River. This is possibly the most satisfying and relaxing game viewing activity in Southern Africa. We head into the park on a small game viewing boat and spend the next few hours till sunset floating slowly down stream while watching the wildlife come down to drink. We get close to the herds of elephants, and have amazing sightings of crocodile, hippo, fish eagle and many more. As the sun sets, we head out of the park with some amazing wildlife and sunset photographs. Includes: Entrance Fees, game drive & Chobe River Boat Cruise. Day 6: Breakfast provided by tour leaders. Day 6: Lunch will be an own expense meal. Day 6: Dinner will be a set meal provided by the lodge. Day 7: Breakfast provided by tour leaders. Day 7: Lunch will be an own expense meal. Day 7: Dinner will be a set meal provided by the lodge. Overnight: Bakwena Lodge – Twin en-suite chalets. Distance / Time: 440kms ± 6½ hours, excludes game drives & stops for wildlife viewing (Savuti – Chobe). Includes: Entrance fees to Victoria Falls. Day 8: Breakfast will be provided by the lodge. Day 8: Lunch is an own expense meal. Day 8: Dinner is an own expense meal at a local restaurant . Overnight: A'Zambezi Lodge, twin rooms with en-suite facilities. Swimming pool, restaurant, bar & telephone. Free WiFi available. Distance / Time: 80kms, ± 1.5 hours, excluding stops for sightseeing. Optional Activities: Scenic flights & many more. Includes: Day 9: Breakfast provided by the lodge. Day 9: Lunch will be an own expense meal. Day 9: Dinner own expense. 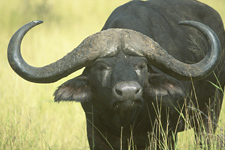 Note: Botswana is considered Southern Africa’s premier game viewing destination. 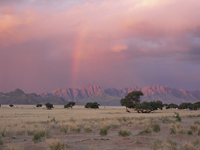 The remote wilderness, limited access for visitors and abundant game make for an exceptional wildlife safari. Sustainable Tourism: A Botswana guide travels with us through the National Parks. This ensures employment for local people and direct benefits for the community from tourism. The local guides are highly knowledgeable so please ask plenty of questions, you’ll be amazed at what you can learn. For the entire safari you travel in a purpose built 4WD Land Cruiser with 12 forward facing seats and trailer for luggage. It has solid roof and back which provides protection from the sun, and dust. The Land Cruiser has 12 individual seats in 4 rows of 3 seats but this tour is limited to a maximum of 8 guests so that everyone has a “window” seat. The light aircraft flight from Maun airport to Khwai airstrip is usually 4-12 seater Cessna or Caravan. Due to bush landing the luggage limits are adhered to. This is an adventure tour, and as such please expect to get involved. Where there are porters, they’ll help you, otherwise you’ll need to carry your own bag. Included meals are all lodge or camp provided. If you have a particular interest, please let your safari leader know, and he/she will endeavour to make your journey more rewarding. The majority of meals on this safari are provided by the lodges. • Anyone who is generally active and in good health should enjoy this trip. • •	As this tour spends a large amount of time in wildlife areas it is essential that you adhere to the tour leaders' (and local guides') instructions regarding interaction with wildlife, camp safety and game walk/drive rules. •	You will need a valid passport and visas for entry into Zimbabwe and Botswana. •	•	We recommend that you bring Euro or US$ for personal expenses on this trip but please note that foreign currency will need to changed into Botswana Pula as shops, restaurants and market vendors only accept BWP. 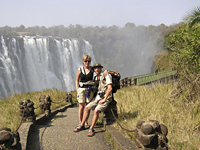 Expenses in Victoria Falls can be paid in US$ and major credit cards can also be used for optional activities. Traveler’s cheques can be changed in Victoria Falls, Kasane and Maun (although in Zimbabwe travellers cheques attract a very high commission). • Is it safe? Botswana is relatively safe and your guide knows the countries intimately and will endeavor to show you the best parts while looking after you. In the wild areas your guide will brief you on the necessary precautions, follow this advice and you will be fine. Be aware of your personal belongings and you will have a great trip!